Clinics are offered Wednesday afternoon and evening, Thursday afternoon, and Friday afternoon and evening. Most are offered two or more times so you don't have to miss one to see another. In this clinic participants will get hands-on training with live plants. A slideshow and discussion about styles and plant choices. A slideshow on how to use Nancy's book and other resources for RR design. This clinic covers choosing the location and what needs to be considered, power, track plans, construction, train controls, buildings, landscaping and general maintenance. "Installing Batteries and Electrical" will feature basic and advanced techniques that can be used in the installation of batteries and sound systems. Jerry’s presentation will be a question and answer time covering the most common questions regarding Roadbed Prep, Track Selection, Power Supply Selection, Wiring Size, and more. He will discuss the many pitfalls you may run into and how to avoid them. Also Jerry will cover the Split Jaw Product line and its many benefits. This talk is aimed at helping you get your Railroad up and running smoothly. This hands-on clinic is limited to 20 participants, first come, first served. In this workshop you will learn the techniques of modular construction for making scratch-built wooden structures. A track-side shanty will be made in class to take home. All materials and tools will be supplied. The $25 fee is due in cash at the clinic. In this clinic, three techniques for building models from scratch will be discussed and demonstrated. This information will be useful for modelers building totally from scratch, kitbashing, or following a prepared kit. No experience necessary. This hands-on clinic is limited to 20 participants, first come, first served. In this workshop you will learn the techniques of modular construction for making scratch-built wooden structures. 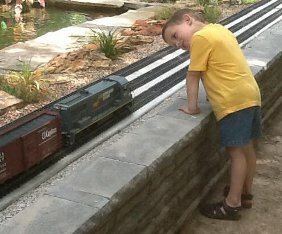 In this workshop you will build to take home one of three railroad yard shacks: outhouse, telephone booth, or tool shed. All materials and tools will be supplied. A 2 part series. Magic Sculpt product is completely weatherproof. All materials and tools will be supplied. A 2 part series in 2 2 hour sessions. This hands-on clinic will provide the participant with a Redwood Structure Kit to assemble using these pinners during the clinic and take home. There will be only 14 kits available with a pinner being shared between two builders. All materials and tools will be supplied. Fairy Gardens and how they can be incorporated into a layout. In the clinic, "Modeling in Stone and Cement" the basics of "All-Weather Modeling" includes video demonstrations, materials and techniques used. "Modeling WaterWheel Mills" includes discussion of water sources, delivery methods, flow contols, the wheel, the building, and raceway. Included are many photos of actual American Mills and 3 working G-Scale models, plus the maintenance of the WaterWheel Mill. "Figures for the 1/20.3 Modeler" is a discussion on scale scenery centering on commercially manufactured people and animals suitable for Fn3 Layouts. An expansive review of over 18 manufacturers products ranging from the obscure Showcase Miniatures to the mainstream Railway Avenue is the main focus. "Vehicles for the 1/20.3 Modeler" a discussion on scale scenery centering on commercially manufactured vehicles including cars, trucks, motorcycle and wagons suitable for Fn3 Layouts. "Customizing People and Vehicles" is a discussion and demonstration of beginner and intermediate techniques for modifying plastic, resin and metal kits in all large scales. •Places to see in Tulsa.